Product #60662 | SKU STHJ16000800 | 0.0 (no ratings yet) Thanks for your rating! 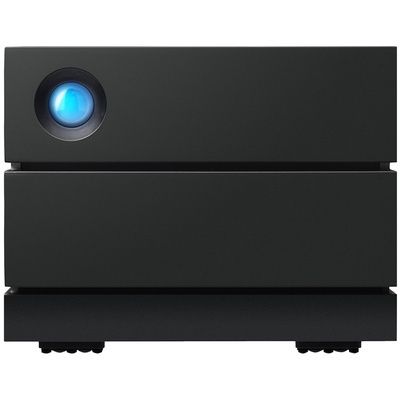 Designed for photo, video, and audio production, graphic design, backup, and archiving, the 16TB 2big 2-Bay USB 3.1 Type-C RAID Array from LaCie has dual 3.5" SATA drive bays, each of which is equipped with a 8TB IronWolf Pro 7200 rpm SATA III 3.5" Enterprise-class hard drives, for a total storage capacity of 16TB. It connects to your host system using its 10 Gb/s USB 3.1 Type-C interface, which is also known as USB 3.1 Gen 2, to provide data transfer speeds of up to 440 MB/s. This RAID may also be used with Thunderbolt 3 hosts and includes a USB cable, an external power supply, and a limited 5-year warranty with data recovery services.